With this guide we would like to enter the campaign of Wolfenstein - The Old Blood ease. In Wolfenstein - The Old Blood, you take the control of the frigid BJ Blazkowicz. The events in Wolfenstein - The Old Blood predate those of Wolfenstein - The New Order. Your mission is to penetrate the Castle Wolfenstein and a war decisive acts of regime size Helga to steal from Schabbs. At the beginning you find yourself as a passenger in a car again, the direction of Castle Wolfenstein drives. Wesley (Agent One) makes you familiar with the mission and urges you to take then on your passport from the glove compartment. Then you follow Wesley up to the checkpoint and show papers to the soldiers. Then embark in the elevator and go along with Wesley by cable car to the castle Wolfenstein. In the cable car station arrive to separate ways. After you get the headset, you take the elevator to the patrolled area of research and kill the guard in the corridor. In the research field arrived, you have still the single guard off the open-plan office. Cover you then an arms and ammunition for the next fight. Wesley tells you with that the file is gone. Go to the radio and take with X Contact to Kessler. Your call will be ended by a shot. Stretch down the attacking soldiers and then meet up again with Wesley. 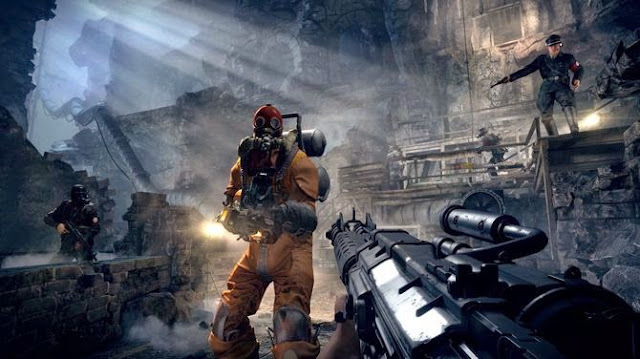 Climb up the ladder and crawl left through the shaft to the prologue of Wolfenstein - The Old Blood finish. After the Opening Scene you find yourself in a cell again. Once you have come, Wesley takes from the neighboring cell to contact you. Your mission is to escape from the cell and to rescue your comrades, because he is just dragged in for questioning. Climb up on the pipes. Now take the pipes and use them as an ice pick to the wall but to climb yet. Once at the top, do you notice the serious soldier. To kill him you have to sneak to the generator, as long X hold until the display is set to 0, and then quickly try to overpower the soldiers from behind. When you have eliminated the first soldier, you put yourself to the electric fence, operate as usual has reached the switch to the 0 power and levers the door then to the tube on. In the next area wait 2 heavy soldiers upon you. Is the first time as described above, but wait until the soldier is outside of sight of the other soldiers. Overwhelmed him from behind, take his heavy machine gun and eliminates the other two. Then go through the door to the next area. Then you go through the next door. Turn back the juice from the levers and door X as usual. Go to the table in front of you and take the medi-pack and the card. Cross then the passage and overpower both dogs. Stay tuned then left and go behind the wall for cover, until the heavy soldier went over. Go to the first generator and switch off the power. Overwhelmed heavy soldiers, take his gun and kill the other 2 heavy guards. Gather up the remaining pieces of armor are one and passes through the next door. You must now left jump on the cable, and then down the stairs. Go down the stairs, turn left and climb at the very end right at the crumbling concrete high. Creep into the air shaft and go to the left. If you have arrived at the end, you see a heavy soldier to walk upon you. Wait until he turns around, jump down and smashed the wooden box. Grab the heavy MG and eliminate the two heavy soldiers. Leave this area as usual through the electrified door. Go through the passage and then immediately left. On the second round arch, there is a sleeping dog and a heavy guard. Wait until she continues her patrol, kill the dog, and then creep into the bay opposite of you. In the shaft you go all the way to the left. Run up to collapse, leave the shaft through the hole left and you leave the room through the door. Go over the bridge, turn right and overwhelmed the heavy soldiers. Take his gun, put it in the elevator, go behind the elevator and turn with X the current one. Make your way back to the elevator and pres the button. Again supplier to the heavy machine gun and go behind the blue concrete square cover. Wait until the heavy soldier is gone by and open fire on two soldiers in the corridor. Then pass through the electric door. Come out and grade climbing up the wall and into the shaft. Follow the course of the chute, jump down and eliminate the two patrolling dogs. Go into the maintenance shaft B and jump through the hole in the ground. In the maintenance shafts arrived, it goes right up to the metal bridge. Turn left, follow the path up to the cistern and break through the broken wall. Climb the crumbling concrete high, going from grade and bends at the junction turn left. At the end of the tunnel you have to climb back on the wall. Once at the top, first eliminate the sleeping watchdog. Crawl right through the chute, leave it and crawling on the left side to slot G. Kill the dog lying in front and go inside. Climb at the end of the maintenance shaft the ladder and turn the heavy troop from the juice. Overwhelmed him as usual and run to the stairs in front of you. Open with X the hatch and climb into the maintenance shaft. Scramble the shaft along and jump on the bed at the end of you. Leave the cell, you turn to the left and run from grade to Falltor. Lever it as usual, take-up and slip under the door through. Then go into the cell, the door is open and smeared with blood and lever there the hatch. Jump on double bed, leave the cell, and put yourself to the office via the "Positive Thoughts". After the X door opened you will HABTM drawn into the room and work with the knife. Push a few times RT and see how BJ stab the attacker. Open the hatch in this room and climb down the shaft. Leave the shaft and go behind the wooden crate for cover until the metal dog has gone through the metal gate. Then sprint to right in the big gear and lever on the left marked the door. Take-up and go underneath. Go up the stairs and put yourself on the parapet. Turn to the left and sprint to the other side there to open the hatch. The metal dog will attack you again and again, so stay on the move. Climb through the shaft to the end, jump down and overwhelmed the commander. Take his gun and work your way quietly to the other side. Gather all there on what you come to arms, munitions and armaments in the slopes. Kill the second commander and flip the switch. You have the alarm trigger and become fired. Reciprocated the fire, but put yourself at the same time to the boat. If you have arrived in the boat, you start it and manned the heavy machine-gun. Kill the drones on the way and the soldiers at the edge of the channel. Leave the boat after it has stopped at a gate and flip the switch. Thus you have completed the first chapter of Wolfenstein - The Old Blood successfully. Increase the cutscene in the boat and set it in motion. Use the heavy MG to the soldiers on the docks to eliminate in front of you. Make sure that behind you soldiers are in an elevated position with the word "ammunition" and attack you. Right off the boat there is a small shelter, there you have the lever tilt to open the gates for the onward journey. Then continue on in the boat, put back a switch in the lock and then pass to the second dock. There you will find among other things 2 commander. We recommend you to go into a crouch to avoid detection and then to start with the elimination of the soldiers. Opposite you is a wall with a gun. Leveraging the crate as cover so that the gunner cannot see you and trigger an alarm. After you've cleared the area, can be found in (from the doorway saw) left room a key on the desk. This requires you to go through the metal gate. Follow the path and jump through the hole in the ground. In the wine cellar arrived, it eliminates the silence pistol out the two soldiers who talk shop about grammar. Complete after the single guard, and the sleeping dog. Make your way to the hatch before the metal grid and jumps in. After case you have to re-float to the surface and climb up the crumbling concrete. So sit on the edge and you rid the patrolling soldiers. Climb up and put yourself on the road on the left. Follow the corridor, eliminating the local station and go through the crawlspace next to the tomb. At the entrance you'll find a skeleton with a throwing knife in his skull. Follow the crawler to crumbling in a way hall meet. Eliminate the two guards present there, go to the altar and then turn left into the canal. Follow the corridor, up the stairs, to the stacked skulls then take the turning. Inspired with you LB around the corner and eliminate the two guards. A soldier run towards you, the other is on the opposite side of the ruin. Take a running jump across the gap. Turn around to the right and then go the narrow stairs to the wall. Here a regime soldier is aware of you. Eliminate him and follow the stairs to the very top. Make sure that you do not fall down. Otherwise you have to go all the way again. Climb at the end of the road on friable rock up, eliminate the patrolling guard in the cellar and then climb through the hatch in the elevator. Climb back up using your pipes, you leaning over the edge and take the soldiers. Pull up on the edge of high, first kill the commander of the opposite of you go on the wooden aisle and then clean the entire area. After you've done that, you have to go to the end of the hall and there as usual with X the metal gate to pry then underneath to slide around. Now you find yourself on a higher gear again. Before you go out, you should take the sniper in the watchtower. Follow the course of the Ganges, the switch routes to go through the open door and passes through the spiral staircase to the dock. Opposite you is the bunker with the mount on the quay marked "ammunition". There is also a sniper, take back your bomb shot rifle and kill him. Now put yourself to the switch with the shelter, once open the gate eliminates any soldiers you encounter. Then jump into the water and swim through the open gate. After you are landed on the bank, you have to follow, the wall hit the pipe and further machine at the open window in front of you the way. We recommend you pre-select the shock Hammer Gun, because inside the hall two heavy Protect (Red Helmet, orange suit). Climb the crumbling concrete high, wait until the orange shotgun shooter is gone to climb. Turn serious shooters with the shock hammer, eliminate all attackers in space and run the transition to the switch to fold. In the passage you expect a third heavier contactors. Kill him as usual with the shock hammer or a grenade. Pass through the spiral staircase down to the dock and walk immediately to the boat, with which you have arrived there. Manned the heavy machine gun and get rid of all soldiers. After you have cleared the dock, you take with the heavy MG and activate cutscene at Falltor. You have completed the second chapter of Wolfenstein - The Old Blood successfully. After the sequence you find yourself back in a large hall. Turn left behind the box cover and take the emerging heavy soldiers with heavy machine, which you have taken from the second chapter. You have with your weapons (most shock Hammer) on its power supply shoot (small, blue luminous generator) until he collapses. Then run quickly to his breast, and travels with him your metal tube ("Overpower") out a piece of his armor. A small piece is now free and you can place this with the hammer shock shoot until he finally collapses. But note that he then destroyed with explosives himself. Kill the other soldiers and put yourself in the command center. Determine where the switch to, take enough on ammunition and armor pieces and put yourself on the stairs on the side to the top. Man where the heavy machine gun and mow down all the enemies to the shrill alarm tone finally stops. Opposite your machine-gun nest there are two hatches. Open one of them, crawling through it, then climbing the crumbling concrete high and then pass into the large kitchen. Wait until the orange Sagittarius is out of sight and sneaking to the arch opposite of you. Kill the commander sneak the corridor to the end and then put yourself to the wine barrels, with the ramp. Use the kitchen elements as cover. Creep up the ramp when the orange gun shooter is not looking and levers with X the hatch. Crawling down the hallway and walk towards the portrait. Link of you a guard patrolling. Kill them, the sleeping watchdog little further forward and the guard in the Hunter Room Rudi considered the bookshelf. At the end of the hallway you will find Helga from Schabbs' room, which is guarded by another unwary soldier. Kill him and break the loose brick in the fireplace. Follow the path until you meet 2 soldiers talking on the balustrade over Helga from Schabbs. Eliminate them quietly and go to the room with the large board. Kill the guard next to the table and then put yourself to the left. Turn the commander in front of you, and work your way up the stairs. Then lever on another hatch, crawling through it, climb on the boxes in front of you and break through the wall. Take the bomb shot gun and turn the machine gunner, and all other enemies. Then follow the passage and climb with X to go through the small opening in the library in which there are 2-point data. Now cleans this area. Leave the library and follow the path until you meet on a metal door under you have to start with slide as usual. Freed Wesley and look at the cutscene. Then run to the room across from the chair with silver metal door. Open it, you bring back your weapons and kill everything and everyone. If you have cleaned the "anatomical theater", you have to get to the elevator to finish the third chapter of Wolfenstein - The Old Blood. After the elevator has stopped, you have to open the hatch and climb pipes on crumbling concrete. So sit on the edge and you rid the patrolling soldiers. Climb up and go to the left. Follow the corridor until you come to a staircase that you have to go up. At the top we recommend you to wait until the heavy soldier pulled over, and then move next to the cable car along. On the web patrolled a soldier, and a dog. Kill both, goes to the other side of the small office and the stairs going up there to the roof. Opens the hatch there, jumping through and flips the switch. The soldiers will be alerted and will attack you. Leave the office through the door and walk to the cable car. Lose yourself. Not engaged in active combat, but turns off only The ones that block you the way to the cable car In the cable car arrived, it sets the switch and starts and your departure. Halfway the juice is turned off, the exact moment than at the other cable car with soldiers next to you stop short and bombards you. Eliminate opponents (Attention they throw grenades), then lever the hatch and slip by means of the pipe to the station below you. Pave you a way into the station and kill all attackers. To turn off the orange shotgun shooters we recommend the use of shock hammer. To switch the power back on and set all other assailant. Make your way back to the cable car and continue your descent. Halfway you will launched from drones and ends up in the river. Go to the door, levers on, swims ashore and kills the two soldiers who talk about you. Run along the path until you meet a warehouse. Go behind the short wall for cover and turned on the commander on the boardwalk from. Climb the right of you at the crumbly stone high, then sit on the edge and kill the guard. Pull up high, straight and climbing goes again on crumbly rock before you high. Ignoring the second commander and shotgun shooters. Jump down on the edge and go behind the wall in the next area to cover. Turn out the two soldiers and put yourself to get around to the right to the shotgun shooters. Now leave this area and go to the elevator up. Turn previously from the two attacking drones. After you exit the elevator, you go through the crawlspace in front of you to get back to the surface. Follow the path up to the bridge and climb up the crumbling concrete. Jump with start on the first hole to the second hole catwalk and balance left on the bar along. The third gap you have to skip back to start. Cover you in the next room with Medi-packs and armor parts, then open the door and kill all the enemies in the camp in front of you. Pay attention to the drones! Then pry the door to the elevator shaft to open the hatch and overpowered the guard inside. You find yourself now in the passport control area from the prologue. Eliminate all attackers and leave the checkpoint. Note that on the stairs a reclining soldier ("Fritz") has positioned and opened fire on you. Leave the building and enter the courtyard. From the upper gears you will shot at by snipers. Kill them first and then the other soldiers who stand in your way. Run to the gatehouse and open by means of the pipe the door. Climb through the open hatch out, go behind the sheet metal cover and reciprocated the fire. We recommend you to make the first drones harmless before you dedicate yourselves to the rest of the soldiers. Make your way to the truck and lock it in a small shed in coverage. Turn the heavy soldiers from where you shoot the blue generators until he collapses, then remove the chest armor by "overpowering" and then as long as this place has an effort until it explodes. Take his heavy MG and go into a back of the shed. A few seconds later appeared on the metal dog from Section 1 and makes you a hard time. Fire with the heavy MG on him until he is finally dead. Edit the remaining attacker with the gun, and then climb up the yellow ladder. Go through the hole in the wall at the wooden gate, smashed the brick wall and follow the path until you can climb up the crumbling stone. Make your way now to the inn. Once there you will invite inside and attack after a short sequence of soldiers. Barricade, and slay the oncoming enemy. If you have survived all waves, Rudi hunters breaking through the wall. He wears an upgraded version of the armor of heavy soldiers. To turn it off as long as you shoot on his two blue generators until he slumps down. Run up to him and as usual a part from his armor. All must make total of 3 times. Then the body is exposed at the chest and you can finally send him to his dog Greta. Run to the hatch and put yourself then with Kessler and Anette the boat. You have finished the fourth chapter of Wolfenstein - The Old Blood with flying colors. Once you have arrived by boat in Wulf Castle, you are Kessler a radio. Take it and push the boat under the dock. Take with all armor and leave the boathouse. Make your way to the left, the soldiers switched from before you, and advances further. To the right of you, on the other side of the channel is a soldier above you wake up. Switches also him with the silenced pistol, puts the big half-timbered house in front with the commander and eliminated him with a pistol from a distance. Now go back to the boathouse. If you turn you left you see a water wheel, a boat and a ladder. Floats over, the ladder climbs and embark in the courtyard. Kill the patrolling commander there and then go up the stairs in front of you until you to the place reaches the have shot her a sentry. Make your way to the very top and rid you of the two sentries. Then clean the storeroom in front of you and then jump through the broken windows to the outside. Turn to the right and run down the path until you encounter an improvised ramp. Go to the edge and on the commanders on the balcony in front of you with the silenced pistol. Repent and jump between the two stores down. Go behind the barrels in coverage until the heavy soldier has gone past you. Move toward half-timbered house with the arches and use the truck as a screen. Go to the red door in cover and kill the commander, who is in front of the shops. Wait again until the heavy guard at you over and climbing over the crate into the back of the truck. Take the heavy MG, eliminating the two heavy soldiers and the simple guard. After you have cleaned the marketplace, you are climbing the ladder at the point high, where there is the first commander. Follow the street until you come to the house of Agent Two. Take the keys to you, open the metal door to the garden and levers on the window. It follows a small dialogue. Take the white shirt, put the weapon into the box and help Pippa The hatch to open sewer. Jump into the cool water and swim to the end, to then climb up there. Once at the top, you kill the two sleeping watchdogs and then get in the kitchen of the inn. Now take the apron and the tray with the wine, leave the kitchen and go to Helga of Schabbs' rooms. Once there, you will turn off the tablet, take the file to you and you will get caught. Interact ( X ) with Helga until you reach the cutscene. Congratulations, you now have also mastered the fifth chapter of Wolfenstein - The Old Blood. After you have returned, you find yourself in the ruined inn again. Break the loose brick on the left in front of you and you paves your way through the attic. Jumps through the hole in the ceiling and overwhelmed the seemingly careless soldier who turns out to be a zombie. Leave the upper floor and fight your way through the burning tavern to the courtyard. Once there, several Undead await you, it bludgeons down the tube and walk through the tunnel ahead of you back to Agent Two (Pippa). Slay the only regime Zombie in front of you and then also Pippa. Take your weapons out of the chest and shoot the wildly shooting zombie on the stairs. Take everything with at Medi-packs and armor before you work you through the burning building. In the narrow corridor many zombies and undead dogs are waiting for you. Take the best shock hammer or the metal pipe to eliminate them. Stay tuned for the undead falling from the ceiling. After you leave the inn, wait for a large group of Zombies behind a wooden gate. As particularly effective here with the heavy MG Akimbo the assault rifle has proved. Work you the alley up to the boathouse. Jump into the water and climb up on the ladder into the boathouse. Attract with X the boat under the bridge and take out the double-barreled shotgun at you, the same BJ transformed into a sawed-off shotgun. Take with all munitions and all pieces of armor and leave the boathouse. Make your way to the left and proceed to Mr. sloping undead. Run to the end of the jetty, jumping into the water and swims through the now open metal grids. Climbing left on the ladder and follow the ridge to climb up the IH crumbly wall can. Once at the top, you can now go to the left or right. When you go to the left, save Anette. You go to the right free Kessler. In both cases, the other is infected and turn as Pippa to undead. You now pave the way for the person of your choice and kill the zombies in the area. Have you Kessler rescued, you must then use the pipe on a rope between two houses over to slip Anette (and kill them) in order to get from there to the loading robot. Open the door and jumps into the channel of you. Dip by one of the two openings for loading robot. If your using X go into the loading robot, you have Kapit. In loading robot arrived, we recommend you a moment to identify the controls of this machine to familiarize yourself before you then the wooden gate by Brecht. Kill all the Undead in the courtyard, then equips a weapon ( Y ) And Shoot the two ropes that keep the drawbridge. After you let down the drawbridge, you go over to the other side and destroy the target. We recommend you to wait until the jeep was set on fire in front of you and all undead gather around him before you bring with a pair of aimed shots to explode the vehicle. Work you now to place in front of and eliminate as far as possible all the soldiers and undead. Leave the loading robot and put yourself in the house with the barred windows. Determine where the lever, run back to the robot and pave your way through the now open to the gatehouse. Clear the square outside the church, then leave the loading robot and put yourself the small stairs to the gatehouse. On the table you will find the key that opens the iron gate you. In the last chapter of Wolfenstein - The Old Blood pave your way through a cemetery towards the grave of King Otto. Ignoring the two soldiers, who talk about you, because of right would transform them into a zombie and trigger the alarm. Go left past them and put yourself directly to the commander-office. Kill him, leave the office and eliminates the other commanders on the watchtower. Then Make your way to the left, the path up to the electric door. Going on as usual and follow the stairs down to the studs. Kill the soldiers in front of you and hold you turn right. Let the heavy soldiers pass, then run quickly to the other side and look for cover there. Try enemy contact to avoid because transform most of the soldiers after the death in zombies and so the alarm is triggered. Use in this area, the small program left and right to the soldiers to go out of my way to go unnoticed to reach the elevator. Once at the bottom, waits until the heavy soldier has turned his backs. Then run to the bathroom, take from there ammo and armor parts and then run through the door opposite in a remote corridor. Slay down the hall, the local station and sprints to the left when no one is looking. Follow the corridor to the electric door. Rotate as usual the power off and then on lever. Before you deflect 3guards. Overwhelmed all, otherwise they transformed into undead and would draw attention to you. Is right next to you down the stairs to the grave, at the junction turn right and then climb through the small gap. You will witness how soldiers fight each other and each other undead. Shoot everyone who stands in your way. Follow the path until you come to a spiral staircase. Go up the stairs as much as possible down and then jump into the water. Climb out on the ladder from the pool, follow the path and bathes the predetermined path along until you can climb through a small gap. Enables the switch in front of you and defend you as long against the advancing undead until the stairs to Helga of Schabbs is free. We recommend you to position themselves on the stairs, so you can not fall in the back the enemy. If the input uncovered, you open the door and look at the sequence. After you have freed, we advise you, the stairs to go to the left you high and take the monster out of there under fire. The monster will attack anyone, both you, and the soldiers. Use for your benefit, so you can attack the monster and you need not worry as far as possible to the soldiers or undead. If the monster is trying to "grab", it is sufficient if you duck, then his arm comes across you and eliminate the other attacker. If you killed the bosses, you go back to the entrance and take the file from Helga to you. The following is a cutscene and then the credits. Congratulation, you have completed the single player campaign of Wolfenstein - The Old Blood successfully.